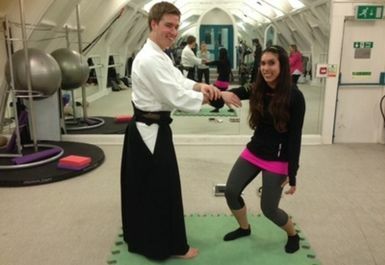 Central London Aikido is a place to learn and practice Aikido, a Japanese martial art. But, unlike many martial arts, this one is also a way to be more successful. It gives you a purposeful practice which you can use to improve all sorts of things in life, whether it's being better at work or being more present with your family. Sensei Adam would love to introduce some of the philosophy behind it. We learn Aikido together as a group. which gives us skills which we can each apply to our own lives. The dojo has in built mats so we won't have to spend any time at the beginning or end of the class laying these down or putting them away so there will be more time for learning all about aikido. Do you need to bring anything? Please just wear loose fitting clothing (t-shirts, sweatpants etc). We practice in bare feet, but please bring a pair of slippers to get from the changing room to the dojo downstairs. Any jewellery will have to be able to be removed or covered over with a plaster (health and safety fun!). This class is located just a short walk from Vauxhall station and numerous bus routes.